Each day I learn a little more about what Dad is considering toxic. Basically anything that is processed and packaged. 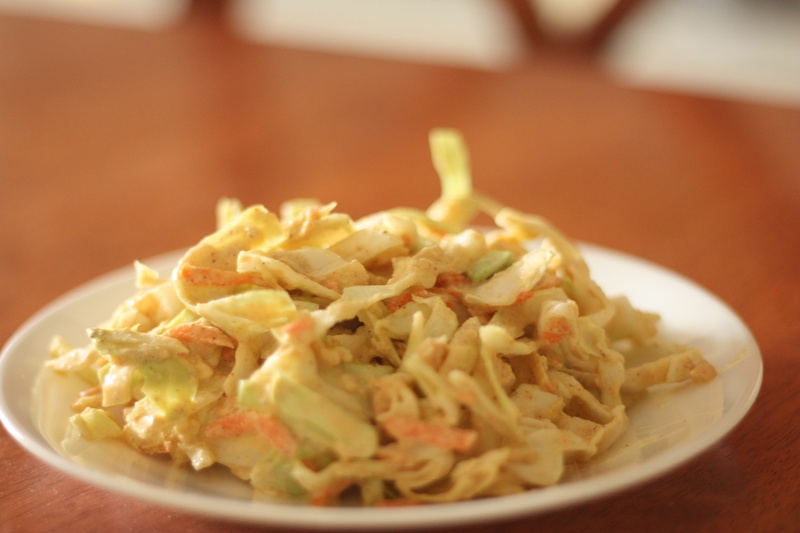 A few weeks back I attempted to recreate my grandma’s coleslaw vegan because I have been craving it. Dad had a few bites and said it tasted good but was toxic. I wanted to make it again so I have decided to make it non-toxic. Dad said it is the best coleslaw he ever had and he ate 3/4 of the bowl. Okay, so I know the seasonings may sound a little weird so I feel I should give a little back story on grandma’s coleslaw. Once you tasted her coleslaw it was what you rated all others by. Seriously, not just family requested it. My sister and I spent many hours over the years trying to get this recipe right, but whenever we went home to make it, something was missing. My grandma is suffering from Parkinson’s Disease along with dementia and is in an assisted living home. Half the time she doesn’t know who were are and she thinks she is still back in Logan, Ohio with her dad and mom. Awhile back we were visiting with my uncle who started asking her about an old recipe she made. She was completely lucid and remembered the recipe like she made it yesterday. My sister and I decided maybe we should ask her one last time for the coleslaw recipe. She began to rattle off the same ingredients we already knew. Miracle Whip, Lawry’s, lemon juice, onion… She then leaned over and whispered, “When grandpa isn’t looking I add a bit of garlic powder.” Finally, the missing ingredient! See, grandpa has always sworn he hated garlic and if he knew it was in something he refused to eat it. I guess as kids she hadn’t trusted us enough not to blow her secret. Since we are going with the non toxic theme I decided to use a nut base instead of Miracle Whip. I love the richness brazil nuts have so I opted for those. I believe you could substitute cashew cream with great results. I had no idea what Miracle Whip tasted like so I asked people on our Facebook page what they considered the closest vegan option. From that inquiry I learned that Miracle Whip had a much sweeter taste than mayonaise. Hence, the dates. My mom’s addition to the salad was the shredded apple which added to the sweetness. You can’t even tell there is an apple added! I wanted to make my own form of Lawry’s and of course there are like ten different people who have made their own versions so I played around with the different ingredients they used until I found a flavor I liked. Who knew it would have clove or cinnamon? I opted to go with fresh garlic because I believe it is healthy. If you prefer a more mild garlic flavor try using powder instead. If you use fresh garlic I recommend adding one clove and taste. Fresh raw garlic can have a real bite. Rinse soaked nuts and dates. Place in blender. Add enough water to reach the top of the nuts. Blend on high speed until creamy. Add ingredients from remaining water to clove. Blend on high for 1 minute. In a large bowl mix cabbage, carrot, apple and dressing. Serve.